Over the past couple of months we have been able to sample all kinds of dishes which are typical of West Africa. Some of the remarkable and every day ones are as follows. In Kindia, Guinea, Nafe kindly cooked a special lunch for us, Sauce de Feuilles. This is very typical cuisine which utilizes leaves as a base for a sauce. The sauce is sometimes cassava leaves, potato leaves or Baobab leaves. It includes onions, tomatoes, hot peppers, smoked fish and dried ochra. One can add chicken or beef or fish. This is a dish one can frequently find at a street stall or rice bar by the road side for 500 CFA or a dollar served with rice. Nafe’s lunch was quite a bit more elaborate than that. Eating street food can be interesting but you definitely take your chances being exposed to unclean conditions. Street vendors we have seen wash their dishes in soap and water but then rinse in unpurified water . If dishes are dry and clean and the food just cooked and hot there is no problem. Another favorite lunch was in Labe at the Resto( restaurant) Calabash. Their Riz Gras was just perfect. Cabbage with tomato, squash, onion and pepper on top of rice with a tomato sauce with the ubiquitous Maggi boullion cube flavoring it.Salt is used with enthusiasm here. In fact when we visted the Bedick animist villages in Eastern Senegal up on the plateau, salt is one of the valued gifts we brought to the women of the village along with Maggi cubes, soap and Gunpowder Green tea for the men.The tea is boiled, sweetened and strained thru the leaves until it is so strong it tastes like a stringent almost tobacco taste. Men drink this through out the day and you are served it in a small shot glass which is about all you really need. Another food discovery I enjoy are the omelette sandwiches they make at taxi stands and train stations ( 350 CFA or about 60 cents). On a cold brisk morning in Djamou sitting on a little wooden bench at a small table, a hot omelette served on crisp bagette hit the spot with a glass of Nescafe before we started our ride to Bafelobe.The lady chef with a baby on her back cooked our omelettes on a charcoal brassier on the ground in a small pan with lots of palm oil. I noticed most Africans like to drink add an enormous amount of Sahel super sweetened condensed milk with a tiny teaspoon of coffee for breakfast. It was more like a milk shake than a coffee drink.Some black turbaned Touaregs sitting next to us slurped theirs down starring at us without responding to my “Bonjour”. They may have only spoken Tamashek. In Bandiagara on our way to the Falaise de Bandigara and the Dogon country, we walked down the dusty street from our hotel with Bill to Le Petit. It is best to ask what they have on the menu that day at a restaurant because even though the printed menu has 40 items, in reality there is really only one dish available and that is what you will eat. That evening they had Ragout de pommes de terres. We ordered 3 of those with cold Castel beers. The Ragout was a delicious stew of potatoes and lamb seasoned with clove served with crispy baguettes. For us the restaurant which was empty of other customers played Bob Marley CD’s. Another food aside is the discovery in Bandiagara of Madame Faida’s homemade Bissap confiture which is hibiscus jam that tastes like blackberries and flowers. We went thru two jars of those in no time. On our final bike endeavor in western Mali we ended up not arriving at our destination of Bafelobe. In our typical fashion just before darkness we came to a Fula village where Mr. Camara kindly took us into his family compound.He took good care of us offering us hot tea,rice, a much needed bucket bath and bed in a tiny hut.In the morning we were woken up by the bleating of kid goats that sounded almost identical to a child’s crying. They were hopping all around the hut and scrambling on the wood pile playing and butting heads. When the Camara family saw we were awake they started coming to the door of the hut inquiring how we slept and greeting us. Mr. Camara appeared with hot tea and bowls of steaming hot corn meal topped with a spoonful of sugar. It was the ultimate breakfast comfort food that got us started out for the last leg of our journey to Bafelobe. Finally I want to mention the fabulous Capitaine Bozo at the Bar Bozo in Mopti. I think it is obligatory that one goes to the Bar Bozo because it overlooks the port of Mopti where all the river boats, pinasses and pirogues dock to pick up passengers and cargo bound for Timbucktou, Djenne, Bamako and Massina or as far away as Gao. The boats are decorated and painted colorfully along the stern and bow with the name and date of the boat’s construction. The most amazing thing is how high the boats are piled with cargo on the roof until the gunnels are mere inches above the water. Everything from motorcycles, Fula herdsmen loading their goats, sheep, chickens, oranges, guavas, mattresses, ceramic water vessels, bananas, bicycles are stacked high with passengers tucked where ever they find a spot. The boats pull out once they are filled the boat assistant continuously bailing as they start their journey. About the Capitaine Bozo. Bozo refers to the fisher people who live along the shores of the Niger and catch the tasty Captaine Nile perch which is cooked in a tomato sauce with onions and bananas. Sounds odd but the taste is something like Asian sweet and sour dishes without the vinegar. The fish is delightful and I have been enjoying it here in Bamako as well.As they say here in Mali ” A Chadi” which is Bambara for “tastes good!”. Our journey cycling from Maliville, Guinea to Dindefelo,Senegal redefines the term “death march”. At 8 am we left the Auberge Indigo heading north.In the beginning the road descending off the Fouta Djalon Plateau was fairly easy, intermittently sandy, gravely and smooth then volcanic rocky sections. We past through a few small villages as we decended in steps down the mountain. Then we saw no villages. An hour past and no one was seen any where. The track became steeper and looser with broken rocks and babyhead rock gardens. We were told this was the “International Route” and possible to cross the border in one day on bikes. This road or track showed no vehicle tracks, only foot prints and maybe a moto track. It soon became steeper yet and over grown with tall grasses. We dropped about 1500 feet in elevation on this track that wound through forested areas with bamboo and giant termite hills then open savannah then back into the woods again. More rocky decents that I would consider to be intermediate technical mountain biking. Only we had about 35 pounds on the back of the bikes. My rear rim had been smashed on the conveyor belt at the airport and we rebuilt the wheel in Kindia. Only the hub had 32 spokes and the new steel rim has 28. Truing the wheel perfectly was not possible rendering my rear brake almost unusable. I got off and walked the worst rock sections while Greg, less risk adverse, rode the rock ledge drops and broken rock sections. Several river crossings, pea gravel, sand sections and brief downhills later it was 5 pm and two hours of day light left and no border in sight. We ran out of water and had to ask at a village to draw water from their well which they graciously did. We were being bitten by deer flies and army ants that I stepped into at a river crossing so we slathered on DEET and continued to push on in hopes of hitting the main road. Fifteen minutes before darkness we came to a Peul village. We were not going any further. We entered the fenceline of the village compound and asked two young men if we could stay there for the night and if they had any food. They responded affirmatively and showed us the way to their hut which was a traditional adobe and rattan round Peul hut with a rattan porch area with bamboo beds. The Diallo brohers gave up their hut, about 15 feet diameter, with a full size bed and fonio straw mattress on one side and two stacks of 100 lb. bags of peanuts to the roof line on the other. They had no food but made some powerful boiled green tea with lots of sugar for us. We gratefully accepted a bucket of water to wash off the sweat, dust and DEET and fell asleep after eating the last of our cookies, one Vache Qui Rie and a Clif Bar. That is Peul hospitality. On Djarama Bwe. When morning came we found that we were at the village on the border and had to have our visas signed to exit and fifty feet beyond there we had to go through customs. 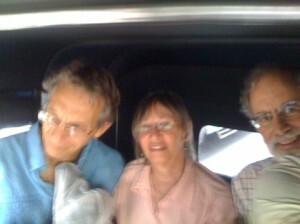 We were at last in Senegal. We arrived last night in Labe after staying four days in the small village of Doucki in the Fouta Djalon highlands west of Pita. We headed west on our bikes to see the Chutes de Kinkon 11/14 on our way to Doucki and on to Telemeli with plans to return to Pita after four days. Our plans went awry almost immediately as signage is minimal to nonexistant on the roads. The Telemeli road is dirt with only traffic being a few taxis, motos and people on foot. First we went the wrong way aaand had to back track several kilometers. Finally we found the turn off to Kinkon after asking people along the way. We arrived at the Chutes which were an 80 meter waterfall into a deep canyon. We came to find out that it was impossible to continue on the road from the falls to Doucki. Again we had to back track asking locals which way to go. By that time it was already afternoon and hot. We also were running out of water and had to keep looking for public wells along the way to refill our water bottles. We must have asked 30 times which way to go as there are dirt tracks and footpaths going every which way with no signs. Often people people did not speak French only Pulaar and we used sign language and the name of the town. By 6 pm it was starting to get dark and we were still 8 miles from our destination. The road was getting steeper and rockier and difficult to climb with the weight of the panniers. Finally we were exhausted aand it was dark. We only had our Petzel headlamps to see and the road was barely discernable in the dark. In the village of Yaga we called it quits and tried to find accommodations to no avail. However we did see parked taxis. Luckily a taxi appeared which we took a ride with the last 5 miles to Doucki. We were dropped off at an intersection in the pitch black. There is no electricity or running water in these villages. Two gentlemen appeared pointing into the darkness directing us to Hassan Bah’s house saying Tout Doit. Go straight. Off we went into the dark stumbling over the rocky road pushing our bikes for what seemed like forever. Finally a fence line appeared out of the darkness. Then a flashlight. We heard a voice in English. Hello how are you man? Hows life? Come this way. It was Hassan Bah. We were welcomed into his family compound in Doucki with open arms. It was then 8:30 pm by then. Immediately we were seated in a open air conical Fula style hut aand we were brought rice with fish and potatoes. Obviously the remains of their dinner. It tasted wonderful. We were shown a Fula hut with a big double bed and water was drawn from the well for a bucket bath. We had ridden 42 miles and were happy to fall into the bed which was a mattress stuffed with the stalks of the fonio plant. Hard as a rock. The next four days we were treated to the incredible hospitality of Hassan Bah and his family. About Hassan Bah. Born in Sierra Leone and fluent in English, Spanish, French and Pulaar. Probably the funniest upbeat person I have ever met. Worked in hospitality at the Zairean Embassy and as a seaman traveling to Spain before returning home. He started leading Peace Corps volunteers on local hikes in 2002 and then developed a small guesthouse business. He provided three meals a day cooked by his wife Mamouna and sister in law Mamadou Binta AKA Lachirri. My accidental nickname Lachirri which means couscous when I confused the food with her name. It stuck. We ate whatever they ate which was delicious sauces of BoroBoro leaves, beans and peanut sauce and rice or fonio, couscous or squash potatoes and onion with pieces of goat meat or chicken. Petit dejeuner was tea and baguette with wild honey and bananas iif available. Each day Hassan guided us on hikes of about two to four hours through the country side. We hiked to Hyena Rock overlook into a deep valley wwith hoo doos aand escarpment cut by erosion and the river. Our favorite hike was Indiana Jones. Hassan pretended to get on his cell phone and call the King of the Monkeys. Allo. Is this the King of the monkeys? Yes man we are coming. No we do not have any bananas. Hey man you are making monkey coffee? We dont want monkey coffee. No man we want regular coffee . Ok see you man bye. Then he called Mrs. Indiana Jones. You will just have to see his performance on video. Words cannot describe this adequately. We dropped into this jungle canyon wwith vines every which way climbing the steep walls of the slot canyon covered with moss and ferns. Hassan demonstrated his gymnastic ability by climbing some of the vines. There were rock arches and small stream running through the canyon. I fell in trying to step out into one of the slots and almost submerged the camera. We arrived at a double waterfall Hassan called the Jacuzzi. Two small pools of warm water like a bath; There is no Bilharzia here in the water so swimming is safe. Climbing out we spotted some shy grey monkeys. No monkey coffee though. The next two days we hiked Wet and Wild and Vulture Rock through traditional Fula villages aand pastures of grazing cattle and women threshing fonio doing the wash in streams. We even got a private tour through one of the older traditional Fula home built of adobe painted and thatch roof maybe in the 30s or 40s.There were more hikes like the Grand Canyon and Chutes and Ladders. We will save those for our return visit. We also visited the local public primary school where there is one teacher for forty students. They were only just getting one more teacher so more kids in the village could attend school. We also visited the health post with very simple facilities manned by one doctor. Dr. Sow. The extent of his inventory of medicine seemed to be what sat on his desk. Not much. Antibiotics and Larium. What they need is a solar panel and small fridge to keep much needed vaccines. We have been thinking how we could help this happen. Solar is the way to go for them in this little village. The doctors here in Guinea have been as helpful as they can be. It has been an interesting insight into third world medicine to be a patient here. There is unfortunately only so much they can do. How lucky we are in the USA. One last hot day in Conakry. The Marché du Niger downtown seemed uncharacteristically low key compared to the seething frenzy we have seen in the market of Kindia and Taouyah. The market ladies are fierce competitors pushing their wares in front of you and on top of their neighbors wares to make a sale. I did not get as much shopping in as I wanted nor as much video footage. As Greg mentioned anyone with a camera is facing adverse conditions and a lot of negative responses. I resorted to my back up camera the little Sony as it is more difficult to be spotted using it. Great caution should be used when ever you see a policeman or anone in military garb. They are notorious extortionists when it comes to cameras and tourists. We concluded that buying the protection of a local who can be the intermediary is the best way to be able to shoot pictures you want. Unfortunately just when we are beginning to feel more at home here, seeing and understanding more we have to leave. My high school French has been put to a severe test here but has improved with daily use. I look forward to when we are able to return again and parle avec tout les gens de Guineé qui sont très amicable et génial! Merci beaucoup Guineé pour tout! Au Revoir la belle pays Guinea ! Last night Greg and I ate dinner at sunset on the only public beach in Conakry. I had fresh fish with delicious pesto like sauce and fried spicy bananas with a condiment of chilipaste that will take your head off. Kids and adults frolicked in the waves while soccer teams played in the sand as far down the beach as we could see. Evenings are warm and balmy after the scorching heat of the day that just about makes you want to pass out. Thank god for air conditioning and fans. However our ac room is not mosquito proof and we had to put up the mosquito net anyway. In search of petit dejeuner ( breakfast) we headed for the local market as Greg described. On the way we crossed a soccer field loaded with players and other teams waiting their turn to play. We passed a small road side stand with enticing looking edibles. The lady proprietor welcomed us — Bienevenue! We bought two of what turned out to be something like our donuts but less sweet. The lady actually spoke english which is uncommon for an adult. Her name is Black Diamond. She has a little beauty shop in her establishment which is more little a jerry rigged lean-to cobbled together on the road side. Hair here is an art form of incredible beauty and creativity. I am tempted to get Black Diamond to braid my hair. I will also add how beautiful and elegant the women are here. Their dress and demeanor is almost regal. There is a sense of propriety combined with exterior reserve. There is so much to say about Guinea! How kind people are and hospitable. I am sad to say that due to my eye condition we will have to return to the USA perhaps tonight. More later. Author Stumpjumper BonniePosted on Sunday, November 19, 2006 Monday, November 20, 2006 Categories West AfricaLeave a comment on Au Revoir la belle pays Guinea !